Our standard carriage charge £7.50 only covers Mainland England, Wales & Southern Scotland for goods up to 4m in length. Additional charges may apply for some bulky or awkward items. Local Deliveries made by our vans will be free for all orders valued over £25 excluding VAT to addresses within our local delivery area. A small order charge will be made of £5 for orders delivered on our transport for orders under £25 excluding VAT in value. 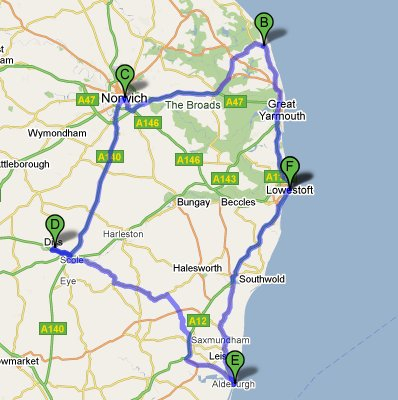 Our free delivery area covers parts of Suffolk and Norfolk, bounded approximately by Winterton in the NE - to Norwich in the NW - south along the line of the A140 to Diss then east to Aldeburgh, Our eastern boundary is the North Sea. This is indicated on the map below with the bounderies being within the blue lines. Some consignments due to extreme size or weight may require alternative delivery arrangements at extra cost in which case we will contact you before despatch.